Today is the first day of my month long giveaway extravaganza!! I’m pretty excited for all of you! I have some amazing prizes ranging in value from $50-$250 EACH! As many of you know (at least those who visit Shugary Sweets often), I love fudge and truffles! I make some variety of fudge quite frequently here on the blog! So much so that “candy” has it’s own category up top there! One of my favorite products I use is Candiquik! I love how quickly it sets up and stays hard! No melting all over your fingers! Today, Candiquik is providing a fun package of goodies for one lucky winner, filled with an assortment of coatings (vanilla and chocolate), sprinkles and some fun fondue goodies, all valued over $50! JUST in time for Christmas baking! And, if you have no idea what to make? Visit Miss Candiquik…she has some fabulous treats on her blog!! Be sure to enter the Rafflecopter below and follow the questions for lots of chances to win! This giveaway will close at midnight on Wednesday, November 28…and a new giveaway will begin! So be sure to enter and come back!! Now, on to this fudge! I used Andes Peppermint Baking Chips to give the bottom layer a creamy texture with peppermint flavor. Then, I went one more step and topped the fudge with some Mini Peppermint Marshmallows and White Candiquik…and some broken candy cane pieces! Easy. Delicious. And would be a perfect gift for family, friends, neighbors, teachers…you get the drift! ENJOY. 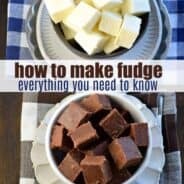 Be sure to check out my guide for how to make fudge for plenty of fudge-making tips and tricks! 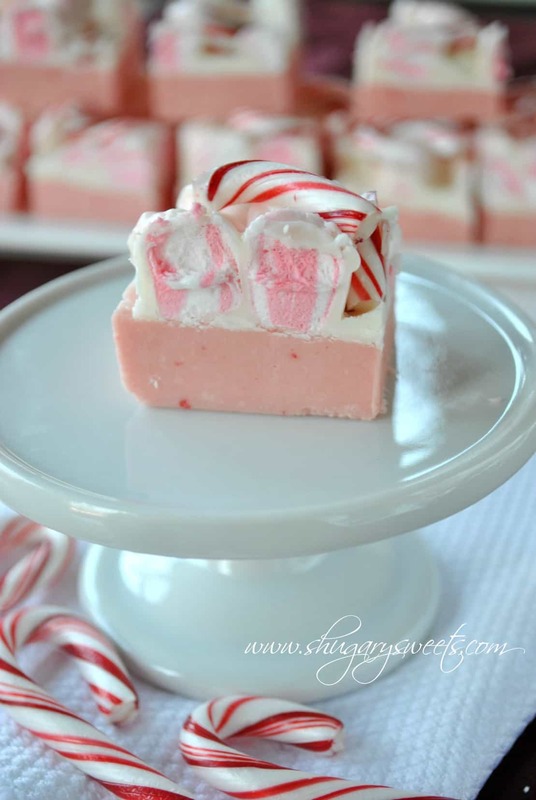 Creamy Peppermint Fudge topped with marshmallow and candy canes. In a mixing bowl, add white chocolate morsels, Andes baking chips and marshmallow creme. Set aside. Prepare a 13x9 baking dish by lining it with parchment paper. Set aside. In medium saucepan, heat butter, heavy cream, sugar and salt over medium high heat. Bring to a boil and continue stirring. Boil for 5 minutes, stirring constantly. Remove from heat. Pour over morsels and marshmallow creme, beating with a whisk until smooth and melted. (I highly suggest using an electric stand or handheld mixer- this fudge is thick)! Pour fudge into prepared baking dish. Melt vanilla candiquik according to package directions. Allow to cool slightly (a couple minutes). Fold in mini marshmallows and pour over top of fudge. Immediately sprinkle with broken candy canes. Allow fudge to set, about 2-3 hours. Cute into bites and enjoy! Not hard at all Michelle! You can do it! My favorite Holiday treat to make is decorated sugar cookies because it just isn’t the holidays without them! These look amazing and I’m printing the recipe to take to a party! Woot! Fun giveaway and love Candiquik! Your fudge looks delish! I make my mom’s Sandies every year. They’re a rolled sugar coated crumbly delight. I’d love your recipe for these if you don’t mind sharing. I love to giveaway Gingerbread Men! That has got to be the prettiest fudge I’ve ever seen! Truly a work of yummy art 🙂 I’me excited for you giveaways! This has to be the most amazing looking fudge I have ever seen! I haven’t tried Candiquick before… Haven’t seen it in any of my local stores. I like to give people a variety of bite size cookies and candies! I love the fun layers in this yummy looking fudge!!! So pretty and perfect for the holiday cookie trays!!! Such a fun giveaway!!! This fudge would make my HAPPY! I’m a big fan of cookies and small, easy to wrap goodies. I also love fudge and truffles! But don’t make them myself.. :/ These pink ones you have made look so cute! I love anything with eggnog in at holiday time. My family loves when I make them chocolate covered peanuts for the holidays! Lookinh forward to making this with my family. Amy! This fudge is amazing. Love, love, love LOVE! My favorite Christmas treat to give is bark. Easy and delish! So true Dorothy! I love bark!! This is seriously the prettiest fudge ever. I definitely would love to try this. Perfect for this time of year! Looks sooo delicious. Putting it on my to do list. Peppermint marshmallows sound heavenly! Especially in some cocoa…mmm… My favorite treat to make for others is either pie or biscotti. I love homemade biscotti too!!! Aimie, you are the fudge queen! This one is so Christmasy, perfect for gift giving. I love giving treats dipped in chocolate but fudge is always easy too! Thanks Joan! You’re so sweet. Treats dipped in chocolate are always a nice gift! I love Candiquick! This fudge looks divine!! I usually find that fudge made with milk or dark chocolate is too rich, but this looks absolutely incredible! Your Peppermint Fudge is about the prettiest treat I’ve ever seen! Can’t wait to try to make it. Where would I look for the Andes Peppermint Baking Chips & Peppermint Marshmallows? I’ve never seen either. I live in northwest WA. sends me a large tin of them for Christmas each year. She’s in poor health now so I’m not likely to get any this year. May have to make my own. Your Christmas Giveaway would sure come in handy in making this fudge. I’m very low income & making treats around the holidays is a luxury. Will keep an eye out for you on Facebook & your blog. 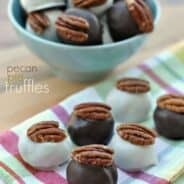 Linda, pecan balls sound delicious!!! Keeping my fingers crossed for ya!! good luck. I found the peppermint marshmallows and Andes Peppermint Baking Chips at my local Target. Thanks for the giveaway!!! Love me some Candiquik!! Love to give homemade cookie/candy platters to friends at Christmas. 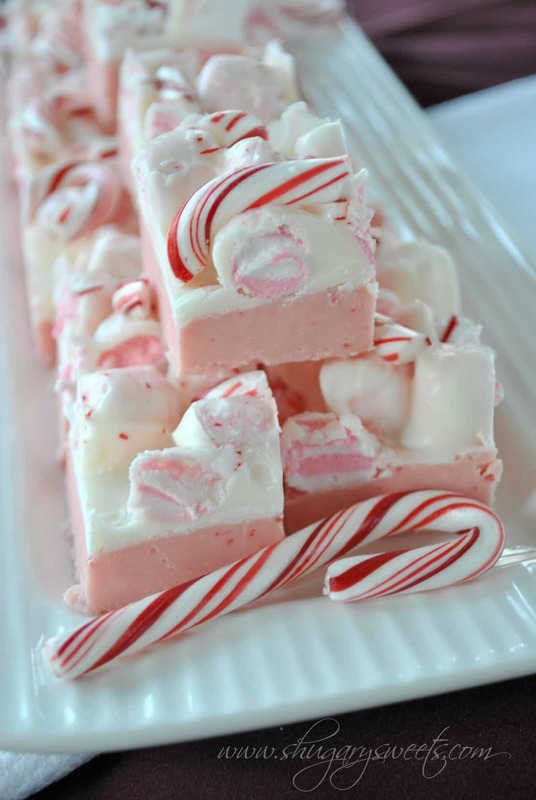 This peppermint fudge would be great on them..
Peppermint is my favorite! Thanks for the recipe and the giveaway! I always make chocolate covered pretzels with my kids to give as gifts. But, I think we may be trying out this fudge this year. I am going to have to try this fudge. my daughter loves peppermint. This fudge looks so good! I love the mini peppermint marshmallows. My favorite treat to make for the holidays is either fudge or cookies. Thanks for hosting the giveaway! I love making and giving Pumpkin Bread. I only make it once a year. I should really make it more often. Your fudge looks AWESOME! I love love love Pumpkin Bread!! this fudge looksss so good! What a pretty holiday treat! I’m a chocolate fudge girl myself, but I’ve never seen peppermint. This recipe is being saved now! You did a brilliant job on the presentation. I’m sure they taste just as good too. Wow, I’m not normally a big fan of fudge – but this I would love to try! Oh that fudge is wonderful! Not only does it sound delicious, but the presentation is adorable with all of the candy canes! I have always loved chocolate covered cherries. My hubby loves Chocolate covered Cherries too!!! I love so many of your recipes! And this fudge looks really yummy! I might have to try making this as a gift this year. It looks really easy, and who doesn’t love fudge? I love to do cookie trays! I need this fudge NOW! I love making homemade marshmallows. This fudge looks absolutely fabulous!!! I love to make truffles and different cookies…gingerbread men and women always! Okay, this fudge looks absolutely amazing! Peppermint is my go-to flavor this time of year. I could eat this all day long. yep pinned to my fudge board! looks so yum! Love making/giving stollen, but I love receiving toffee! My favorite homemade treat is my cousin’s cinnamon bread. We freeze the mini loaves she gives us and eat it after the holidays. I love freezing treats, especially breads and muffins! Great tip Elizabeth! I’m looking forward to the tin of baklava my office receives every year! It to die for! Thanks for sharing your wonderful recipes with us! I enjoy making and giving mini loaf breads. Quick breads are simply the best gift! And who doesn’t love receiving homemade candy? Good answers!!! My grandmothers homemade pecan caramels! Mini peppermint marshmallows? I don’t think I have ever seen those. I think I need to pay more attention when I’m at the grocery store! Fudge is like the perfect food! It’s easy, it’s portable, and the possibilities are endless! 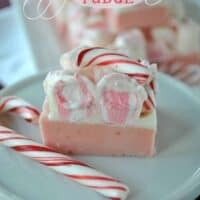 Love peppermint fudge, it’s one of my most favorites! I love peppermint fudge! I would love to win this! I love your fudge recipe and giveaway! 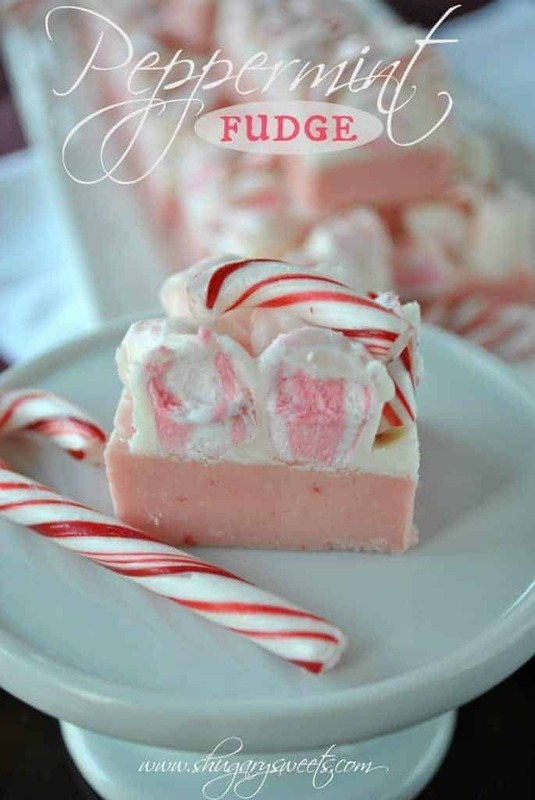 This fudge is so pretty and I bet delicious, I just love all things peppermint! i’m glad you introduced me to candiquick I have seen it but didn’t know much about it. I am going to make this fudge for sure for the holiday season, thanks for the recipe! Enjoy Suzanne, I love using Candiquik for different recipes! Good luck! I love making fudge, but never tried a new spin, this may just be the treat to try!! So many people have asked me for your website thanks to the fudge I’ve been making and sharing. Thanks for having fun and easy recipes! Awww, sweetest comment of the day!! Thank you Keri, and thanks for sharing my website with others! My favorite holiday treat to give out are rolo pretzel turtles. They are easy peasy to make and so yummy. My favorite treat to receive is caramel praline crunch that my mother in law makes. It is decadent! 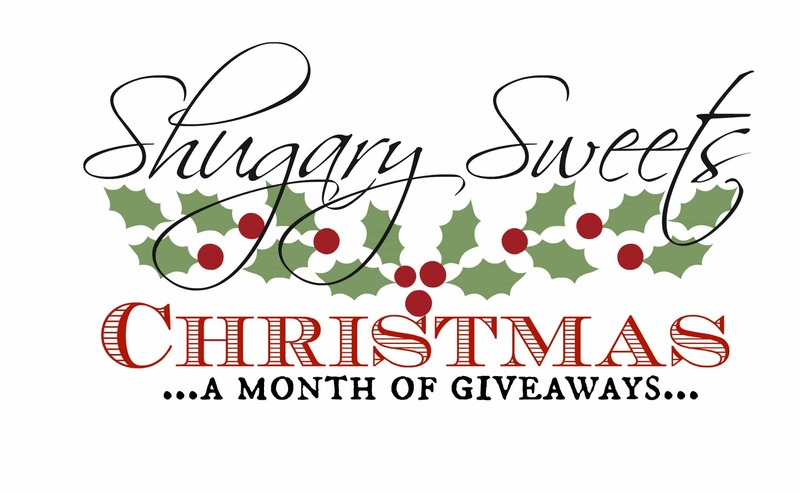 My favorite treats to give away for Christmas is sugared pecans and fudge. I cannot wait to try this recipe! I’m always looking for good holiday themed recipes – and I especially love new candy and fudge recipes! I love to make, eat and give fudge!! But that peppermint fudge HAS to be made in my house too this holiday! Fudge is my favorite ! My sis would love this peppermint, may have to send some to her! Anything with chocolate is what I love to give away, make, and/or eat! I made fudge today but it’s pretty messy. 🙂 This looks so good and it doesn’t hurt that it’s super cute! Wish we had candy canes or peppermints over here. And fun… giveaways! Wow Aimee, these are incredibly beautiful. I love the colours and everything. I bet they’re incredible. Made these tonight for a party tomorrow. Thanks for the share! Sandi, let me know what your party go-ers think! YUM! Made Cookies and Cream fudge and the Peppermint fudge for my co-workers at school….I am their favorite cook! Tried making this, but had a problem. After heating the appropriate ingredients. I poured the heated mixture over the other ingredients as directed above. However, my mixture was not smooth. Can anyone help, what did I do wrong? Thanks for the reply. I hand mixed it rather than used an electric mixer. Maybe I’ll try again and use an electric mixer, I must have gave up too quickly. One other question. Is there another version of the Anede’s banking chips? The kind I got made the mixture more brown then pink as shown in the picture. I just made a batch of this fudge and mine didn’t turn out creamy either. I used an electric whisk in mine. In fact mine had some kind of red oily liquid seeping out if it. I followed directions just as written. I am now waiting on it to cool so I can hopefully have it turn out right. I’ve made this fudge twice now (and it’s my basic recipe). I’m not quite sure why it didn’t turn out for you. I wonder if there was a bad batch of these baking chips? Both times mine turned out pink and pretty. I would just say, double check the ingredients, and cooking time. Sorry Jennifer! I am glad to reply that once it sat up in the fridge it turned out great. I did however, pour out some of that red oily juice that seemed to appear after everything was mixed, before I placed it in the fridge. Both my husband and in-laws loved it. I will be making this again to give as a gift along with some other treats to my husbands bosses and fellow employees. I’m also going to try making it with milk chocolate morsels and see how it turns out. I’m glad to hear they set up good for you and you enjoyed them. I’m still not quite sure what that red oily juice was, but glad it posed no problem to the end result!! Thanks for letting me know how they turned out! Hey does this need to be refrigerated or can it be stored at room temp? Looks AMAZING would love to make as gifts 😀 Thanks! This looks wonderful cant wait to make it! I had seen this recipe on Pinterest and finally got the chance to try it. I had followed all of the ingredients and directions posted above. I had expected the fudge itself to turn pink, like the picture shows. Instead, it was brown. This had me confused and wondering if the picture was the result of the directions, or possibly belonged to a different recipe. When I had started mixing my boiled mixture with the morsels, baking chips, and marshmallow creme, it was extremely thick and constantly oozing butter. Before pouring in the pan to set, I had to drain all of the sitting butter twice! The outcome, however, had set successfully, still looking nothing like the picture posted. My husband picked up the regular andes chips and mine was also brown. I had an issue with it not being creamy when I added it to the chip mixture. I actually put it back on some heat to help melt it a little better. Mine is very oozy with oil also. I intended to make two batches for my sons Christmas party at school, but waiting to see how the first batch turns out once I refrigerate it. Hopefully it is still good. what and where do I get candiquick? Candiquik can be disguised under several names. Some stores will call it vanilla candy coating…or vanilla almond bark. It’s usually found in the same section as your chocolate chips, and it’s sold in a solid chunk. Hope this helps! Hi, I made this fudge last night. I am happy with how it turned out. Except its not pink…I know there are a few others who had the same problem, I just don’t see an answer for the problem we’ve all had. I don’t understand how it could be pink with out having some sort of food coloring. And even then, with having the chocolate andes mints in there, how would it turn pink anyway? Please answer my question, thank you! Had the same problem that it was not smooth and it was oily as well. I can’t imagine why this is not smooth for some of you. You are using the Andes Peppermint Crunch Baking chips? I am making this again on Monday, I will try to take photos of the process and update my post with those photos!!! I used the Andes peppermint crunch chips. One thought I had after poking around online was that the sugar, butter, cream mixture boiled too long or too high. Almost all other recipes online call for a candy thermometer. Maybe the temp got too high and crystallized? I am not sure. Hmmm, maybe for grins and giggles I will stick my candy thermometer in there too on Monday and check out the temp for you all!! Thanks for the feedback! Hi there, just made the peppermint fudge. The first layer seemed greasy to me. I blotted it before I added the marshmallow/candiquik layer. Is that normal or did I do something wrong. By the way I made the red velvet triffle for thanksgiving and they practically liked the bowl. I added some rasberries as part of the layers and then I also soaked the cake layer with ameretto liquer. It was delicious!! thanks for the great recipe. I made two more batches this week, and honestly am not sure why there is trouble. The batter definitely is thick, but there should be no liquid. Are you using an electric mixer to whisk in the chips and marshmallow? The fudge is very thick, so I do suggest using a handheld or stand mixer (I updated the recipe to include that). I still am not sure about the liquid, the only thing I can think is because I use a stand mixer I never saw it (it just mixed it all up for me)? Hi, the same thing just happened to me and I used my Kitchen Aid mixer…wow, what a complete mess, the liquid splattered everywhere and yes I followed the directions to the letter…the paste tastes good, so will carry on and let it set up in the fridge. Hmmm, not sure about why that would happen still! Hope it turned out okay. I love your recipe but I am confused as to what candiquik is. I have never heard of that and have been searching everywhere for it! Is it like the chocolate/candy wafers used for candy making that they sell at Michaels? From the directions, that’s what it sounds like…..
Candiquik is also sometimes called vanilla bark, or almond bark. It’s sold in a block usually in the grocery store next to the chocolate chips. Hope this helps! Thanks for sharing this recipe! My friend and I made it for our holiday baking, and I used mine in some gift baskets and everyone has loved them! I also a while ago made your chocolate cherry fudge recipe and that looked so beautiful and also got a lot of rave reviews and requests for the recipe. They were both so easy to make too. Thanks for the feedback Renae! I’m so glad you enjoyed the recipe! Have a great holiday! I’m sorry, but all I had was a big puddle of oil on my fudge. I used my hand mixer as suggested, and even had my husband try to mix it up. This recipe cost a lot of money to make and you should not have a fudge with oil sitting on the top. Jennifer, maybe the secret is to pour off the oil. My problem is you shouldn’t have to pour off the oil. It should mix with the other ingredients. I’m disappointed because it cost so much to make it and then have it flop. I can’t figure out why several of you have oil in your mixture! I’ve now made this half a dozen times, with no problems. I think I might have to do a video or step by step photos! It is a very thick fudge base, but it shouldn’t be oily. Unless Andes product varies by batch, because many have commented and made this just fine, while others are having issues with oil!? I’m so sorry, I know how frustrating it can be when a recipe results in wasted ingredients. Aimee, I wonder if it has something to do with humidity. I also wonder if I beat it too long with my hand mixer. Maybe I should have stopped when it was crumbles and patted it into the pan. It’s not your fault! It’s just disappointing! It’s pretty though! I got my daughter to make this over the Christmas holiday’s. This was THE BEST treat we had during the whole holiday season. Even my finicky cat loves it! We already bought the ingredients to make it for Valentine’s Day – beautiful pink color. We’re trying to find a way to adapt the recipe to Heath toffee bits. Love your homemade candies and sweets! Love peppermint! Unfortunately in Germany are many ingredients not available :(( Last year I bought peppermint via A_mazon in the USA, so I have some to make delicious sweets (made chocolate pops). But where will i get ‘Andes Peppermint Crunch baking chips’? Wow! These look incredible! How did they turn out? Very sweet? They look ssssoooo delicious! I’ve never seen peppermint marshmellows? I found them at Walmart last year. You can always use regular marshmallows with extra peppermint candy. I would love to make the peppermint fudge but I have never seen mini peppermint marshmellows. Where can I find them. I love making candy for the holidays. I make a few different flavors of fudge each season but never thought to use the white baking chips. I usually make chocolate with crushed peppermint but your looks so pretty I’m going have to give it a try this year. What could I use in place of these? I just found these this past weekend at Walmart. 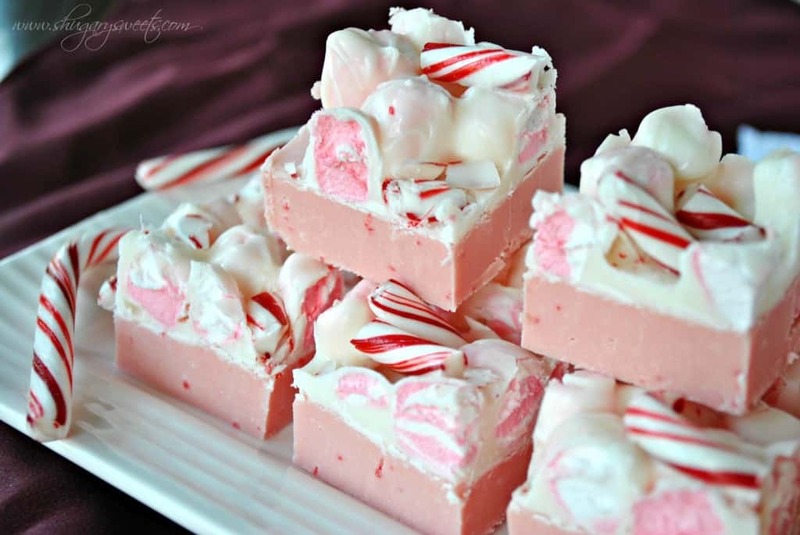 I would love to make peppermint fudge , never had it , I am sure it’s really good , it’s also pretty . I made this tonight and it is setting now. I also had the oily issue. I *think* it is just the melted andes peppermint crunch bits causing the oily red liquid. I didn’t pour it off, just hoping it sets well and cuts up nicely so my husband can take it to work tomorrow. It looks good, although I was a little disconcerted by the oil. I also followed the recipe exactly, even setting a timer while the liquid was boiling. Thanks so much for this great recipe! I made 2 batches last night, one for a bake sale and the other for family and gifts. It turned out wonderful! It’s such a pretty color, it’s flying off the table at the bake sale!! I made this this afternoon and I too had the “problem” of the excess red liquid. I boiled the stuff for exactly 5 minutes as directed and used an electric mixer. It made a huge mess. I scooped the base layer out of the bowl so I avoided the majority of the liquid getting into the pan. I still had some but it did set up well and tastes great. I usually keep my fudge in the refrigerator to keep it chilled. Made this last night for gift giving. It came out perfect. So rich and yummy… Thank you so much for this wonderful recipe. Merry Christmas! Would love to make this fudge – need to think of some substitutions as a couple of the ingredients are not available in South Africa, i.e. Hmmm, that’s a lot of substitutions. Since I’m not familiar with the products you do have available, unfortunately I can’t help. Maybe try googling what you can substitute? Good luck! So sad… we live in Australia and cant get most of these ingredients. Boo hoo. 🙁 It looks beautiful. I made this fudge tonight, and it is wonderful. Easy and delicious! I’m giving part of it to my daughter tomorrow for Valentine’s Day. I placed it in a white box with red tissue paper, and it’s so pretty. Thanks for sharing your recipe Aimee. It’s a keeper! Pingback: 400 Christmas Recipes, DIY, and Gift Ideas - My Life, Blogged. Hi, Just found this site and recipe. Would this fudge work to pour into the silicone brownie bites mold? I have a cookie exchange that I’ll need to make 144 treats for and would like to make my life simple. Also, what makes the fudge pink? is there food coloring involved? This looks delicious! I love peppermint! I’ve tried this fudge twice, and both times the white morsels “seized” because the mixture is too hot. How do you get your morsels not to seize? I have just made this fudge and it came out perfect! Can’t wait to sample the finished product. 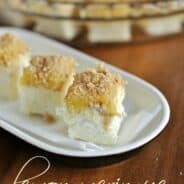 Pingback: 16 Incredible Desserts That Don’t Require An Oven | Hey Grubbi! So pretty with that marshmallow topping! Yum and thank you! So forgot candi quick, so instead I scattered and pressed mini peppermint marshmallows and the crushed peppermint candies into the top of the freshly poured fudge. Pretty to look at and delicious! Not too sweet and peppermint taste was not over the top. Amazing recipe. Definitely a keeper. I had to let you know that I love this recipe. I’ve made it a few years now and I am very happy to report the Andes Peppermint Crunch is available through Amazon now. SCORE! My grocery stores in Texas do not stock it and Target is ALWAYS sold out. Last year, I spent three hours opening and chopping…NOT a good idea. LOL. Everyone loves the fudge and it’s a big hit for something sweet after all the savory Christmas eats.